I’ve been amazed, and deeply frustrated, at the complexity of a full software defined radio software suite setup. I expect mine is tad bit more complex than some, but nothing extraordinary. Behind the scenes two vital software utilities have to be fully fired up – VAC (Virtual Audio Cables) which manages audio connections “in the black box,” and a Serial Port Manager (I use VSP Manager which is further managed by DDUtil) which manages “Pairings” of virtual serial port assignments. It is at the DDUTIL level that complexity is the greatest. Ok, inside your computer you don’t have the ability to “patch” audio to the various programs like you would if each “piece” of the Audio Chain were a separate physical component. Unlike putting together a stereo rack where you can cable the tuner to the amp, the CD player to the Amp, the CDRom Burner to perhaps all, and those legacy Turntable & Tape Decks to the amp – or in cases where the tuner acts as the “hub” they get hard cabled there… in the SDR software suite software has to patch the audio to where it needs to flow or return. Eugene Muzychenko has created the needed software, his product being what 99% of radio amateurs working with this problem use. VAC is audiophile grade software, with oodles of configuration selections that arguably are best left alone or setup in known working configuration for our purposes. Please note that the free demo version of VAC is unsuitable for anything other than setting up basic configurations. Do not use it on the air as the Demo Message will raise havoc. VAC is a 22 Euro or USD $30 investment that being rather unique should be planned as part of your setup costs to do complex SDR. Actually you can buy VAC from the developer for $25.20 to $50.50 depending on the level of support you want. He also has a number of resellers. In my case I have only one pair of VAC Cables setup, though technically I would benefit from a second set connected to the RX2 (technically third receiver) in the Flex-5000A. K5FR is the person behind the next two parts of the puzzle. VSP Manager creates pairs of virtual serial ports. There are alternatives to VSP Manager, and various technical reasons bantered about why this or that Virtual Serial Port is better. Working well and being highly compatible with the real gatekeeper – DDUtil – is reason enough for me to stick with VSP Manager. Now we get to the “switchboard, Router & patch panel” hub of the whole setup. …..DDUtil, which is short for Data Decoder Utility. DDUtil was designed to enhance the operating experience for Flex Radio users by providing advanced connectivity to peripheral equipment and Radio Control Programs (RCPs) not before available. DDUtil provides the automation required to decode and present transmit frequency data to select frequency sensitive devices such as linear amplifiers, antenna controllers (SteppIR), antenna tuners, antenna band switchers, etc. DDUtil may be used in a stand-alone mode or with up to four (5) Radio Control Programs(RCPs) running simultaneously. DDUtil automatically senses when a RCP is trying to communicate with PowerSDR and modifies it’s mode of operation accordingly. AnXMLfile is used to provide the reference data needed for the BCDoutput data. A sample file is included with the distribution files to serve as a guide. This file may be created from scratch or modified from the sample provided and then saved with an appropriate user name. All file modification may be accomplished within the program or may be done in any XML file editor of the users choice. But, unless the user is familiar with XML file editing it is recommended that XML file modification be confined to DDUtil until proficiency is obtained. Please note that this file requires a specific format see the BCD Data File Format topic in Setup / Other Topics for details. The initial release is designed for the Flex family of radios including the SDR-1000, Flex-5000, Flex-3000 and Flex-1500 series….. Setting up DDUtil is a bit of a fiddle unless you make time to read the Wiki and the excellent articles at the Flex-Radio Knowledge-Base. I would roughly estimate that the time I didn’t invest reading first cost me 4 to 5 times as much time fiddling & fixing later. First of the two big enemies of “Radio in Computer” seem to be Latency – the delays introduced by hardware & software in audio streams, program functions, program-to-program data transfer, or between the SDR hardware (the “physical radio”) and the Computer (the “Software Radio”). Tweaking in software design and optimizing components can make a huge reduction in induced Latency. I’ve fought issues with software not in the SDR suite of programs dragging my system down – an early version of TeamViewer and various software update nag-ware programs have been the worse. Adobe products and some Anti-Virus packages can be a problem as well. 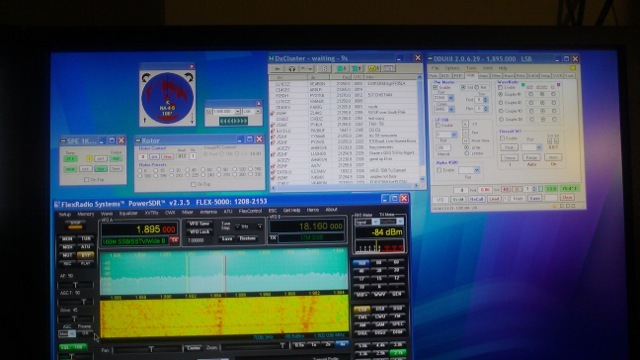 Flex-Radio includes in its PowerSDR and Flex-Radio software a program simply called “Flex-Radio” which can be used to closely monitor system Latency. The software will help you configure the software to optimize given your computer’s measured latency. The second bugabo is the Conflicts can occur and are such a devil to sort out. Things like various software fighting to access the same Serial Port, creating more than one Serial Port assigned the same number, fights between port assignments with expansion software, programs that are “just crabby” and don’t play well with others…. The list is fairly long and sticking with known compatible combinations can help you get up and running easily. If you are like me and want to fiddle with other software while running the station – a browser, an editor to make notes, a call book lookup program, some space weather, weather, and time programs…. well it can be a fiddle sorting things out. Several browsers seem to “bloat” while running the SDR suite and specially Safari for Windows seems to hog system resources upsetting the rest of the system. I’m looking into replacing the several year old Dell Windows-XP dual core machine I am using with a new Windows-7 Multi-Core machine with its greater capabilities. One of my Dayton 2012 goals was to talk with Neal K3NC the PowerSDR Computer guru at the Flex-Radio booth, though Neal has had to take a pass for Dayton this year for health reasons. How do you get enough physical ports to plug in all your stuff? So how does one hook up seven serial cables to a machine that came set up for two? I bought a Serial Port Expansion Module that had formerly been used as part of a commercial Point-of-Sale setup. This added eight assignable ports easily and with high reliability. Word of warning, one has to again read the directions in assigning port numbers to the expansion unit so they neither conflict with existing port assignments or overlap your VSP Manager assignments. Some of your software may require specific restrictions on post assignments you need to work around as well. More esoteric deep in your machine USB and Serial ports can interact as well. Consider this an advanced subject! What do you get for braving all the “Lions and Tigers and Bears” of doing a full SDR software suite? As it is easy to chronicle the woes of getting (and keeping) the software running, one forgets that their is some real joy to be gained in doing all this. A DX Chasing “Machine” that has integrated rotor, amp, tuner and wattmeter displays & controls. In my case the SPE Expert 1KW Amp, Palstar AT-Auto Antenna Tuner, Array Solutions PowerMaster SWR Meter and Green Heron RT-20 rotor controller are all integrated. Quick switch between a QRO SSB setup to a digital mode station running JT65-HF or fldigi(Win) seamlessly. Integrated logging (though I do have to manually add into my master log adi logs from auxiliary programs). Receive performance rivaling top shelf dedicated monitoring receivers costing more than my entire station investment. Other than the likely computer system update, the biggest forward change I see is to replace the Array Solutions RatPAK remote antenna switch with a configuration that can be controlled by the software. I can either reconfigure feed lines to cover 160m-10m without an external antenna switch, or find a remote switch that can interface. Looks like a Dayton 2012 “to do list” item to figure out what remote switch would work. Through using the DDUtil suite I have learned that under certain circumstances my Flex-5000A’s power supply is underperforming, and that is on the upgrade list. Remoting everything is up there. Likely to wait until the Computer Update is done, this involves a small hardware hack of the Flex-5000A itself to allow remote power switch control. Making use of a multi-antenna “diversity” listening configuration – as mentioned if I can hear the DX station I can usually work them, so further improving the stations “ears” only makes sense. Power SDR has built-in features that I haven’t even begun to exploit when it comes to using the RX2 receiver and multiple antenna configurations. All in all a lot of fun, easy to set up if you bite off small chunks at a time and read the instructions, and well worth the effort in results. 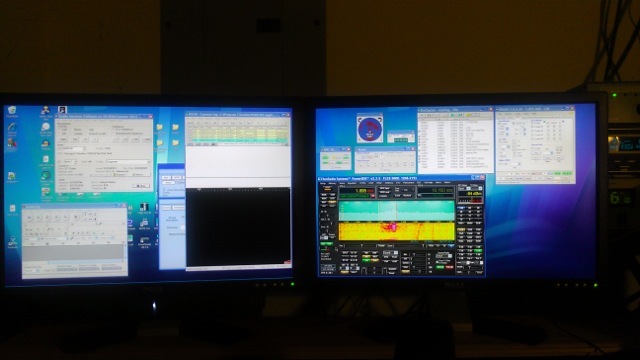 Have been doing some reconfiguration in the K9ZW Shack. 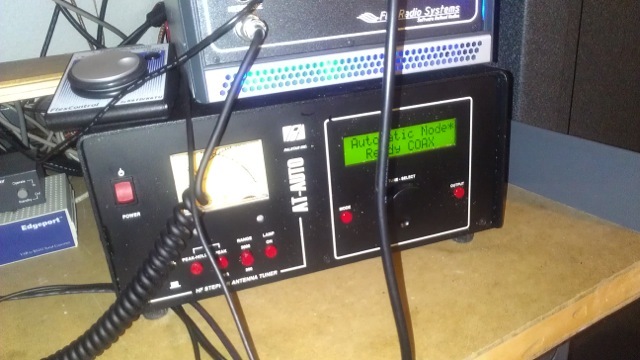 This Utility allows for “passive listening” devices doing frequency following of a transceiver’s VFO and will control or read the Array Systems PowerMaster SWR Meter, the Green Heron Rotor Control, the Expert 1K Amp, the Palstar AT-Auto Tuner and of course the Flex-Radio Flex-5000A Transceiver. Here is a sample of what my dual screen set up looks like. The blue window behind MixW is Flex Radio’s monitor, as I was debugging at the time. The SPE Expert 1KW Amp is doing very well! I quite enjoy its instant-on feature, and how it syncs with the Flex-5000A through DDUtil. I am a bit less convinced about the Palstar AT-Auto Antenna Tuner. I only need a tuner on 80m and 160m, as all other bands tune 1:1.15 or better barefoot. This particular tuner is a bit of an orphan due to some legal wrangling that has left Palstar unable to service the unit, and the successor a complete unknown. It is also pretty slow tuning between bands. Here is a close-up of the Right Hand Screen – the Business Screen. Power SDR is running at the bottom, then clockwise the DDUtil SPE Expert Amp Panel Control, next to it the DDUtil Rotor Control Program, above that the Map Display from MixW, next to it (smallest item) is MixW Frequency Output, the MixW DX Cluster is running top center and then to the right the main DDUtil Program. I am still tweaking this setup, and hope to have the bugs worked out soon. Did the gear shuffle, putting the SPE Expert 1K-FA Amplifier and the Palstar AT-Auto Antenna Tuner in place at my operating station. Everything went into place well, with only some fussiness with my dual computer monitors frustrating me briefly. Enlisted Victor KC9NWB, my 16 year old youngest son, to diagnose the computer graphics card. He correctly thought that the card and monitors auto-sensed themselves into an adjusted configuration that took only a few key clicks and a restart (even though it should have needed a restart) to fully correct – thanks Vic KC9NWB! Added Anderson Powerpoles to the power cord for the AT-Auto and it fired right up. Gingerly I fired up the Expert Amp, leaving it in Standby mode. I’ve decided to initially run both items in their Frequency-Sensing Automatic Modes, and to deal with interfacing their CAT (Computer Aided Transceiver) connections to the Flex-5000a and PowerSDR Software as a second phase for later in the week. 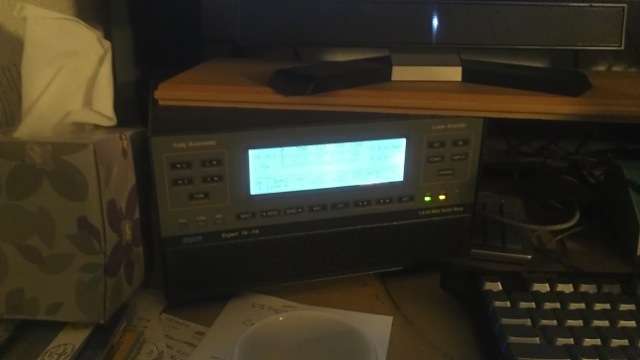 It was lickety-split and I was ready to make first transmissions as the 1.895 kHz 160m Everynight Net preamble was being read. First reports from KD8KW were very favorable. In-between the two rounds of the evening’s 30+ member 160m roundtable, I did pop over to 14.260 for a 20m contact with K7UGA, the Arizona Special Event Station celebrating Arizona’s Centennial and using Sen. Barry Goldwater (SK) K7UGA call. Returning to 160m was very quick and when I explained that I was on new gear more reports of booming easy to understand signals were received. Band conditions and a call to late light dinner put an end to the first test session, which even though a session limited to a handful of QSOs on two bands, was an easier success than I had expected. Hoping to give the revised station configuration a good workout this week and next weekend. More after I put a hundred or QSOs on the configuration. Then it will be a matter of interfacing the CAT capabilities, followed with a stab at removing the station. If it works out I would like to try to run at least some QSOs remotely from elsewhere in the house and perhaps from other locations over the internet. Would be a really thrill to be able to log a few QSOs while traveling if it can be made to work! Tinkering a bit with the shack and at least for a while will be swapping out the Alpha-78 Amp and the Palstar AT4K(mil) Tuner for an Expert 1K-FA Amp and a Palstar AT-Auto Tuner. Bought the Amp as a backup and field portable amp. I’d used this one before with a TenTec Omni-VII and Orion, and when my friend George W9EVT said he was going to sell it I quickly made him an offer which he accepted. The original Expert 1K-FA Amp has a mixed history, with the USA dealership bouncing between firms, support being on/off, and importantly the original series I & II 1K-FA amps requiring upgrades to be reliable. This particular amp was fully updated by Bill Leahey, K0ZL (SK) a few weeks before he was injured & passed, and is ready to go. While the Expert 1K-FA will be down on power from what the Alpha-78 can put out, I usually loaf the Alpha at about 60% which may bring the changes in ERP to a small percentage difference. That the Expert is possible to remote and integrate in my computer driven station suggest it may be a great companion to the Flex-5000a. The AT-Auto tuner is on “trial” as I am again interested in exploring how it will integrate into my station. Built by Palstar the AT-Auto is a bit of an orphan, as a legal battle ended with Palstar losing and Kessler Engineering wining. K.E. does support the tuner for repairs & accessories, but hasn’t any new units available. Last year at Dayton they said they were weeks away from launching an updated version – perhaps Dayton 2012 will see the new AT-Auto II launch? With the Flex-5000a the AT-Auto should track band switching and be reasonably fast. Given that I only actually need a tuner for 160m and 80m with my main antennas, as 40m, 20m, 17m, 15m, 12m, 10m and 6m are all 1.3:1 or better untuned, I will likely avoid the one downside to the AT-Auto of a 45+ second mechanical inductor retune with a 160m-to-20m direct bandswitch. The AT-Auto is bit more a gamble, as if K.E. fails it could be an unsupported & unrepairable orphan. On the plus side the used prices reflect the risk and make it much more affordable. If both the Expert 1K-FA and Palstar AT-Auto integrate well I will be narrowing down to the antenna switch and power-supply control to complete my station’s automation goals. In theory the result should be a Remote-Ready station 100% mouse controllable. Oh, to answer the obvious question right away, neither the Alpha-78 nor Palstar AT4K(mil) are presently for sale. For the time being they will get put into heated storage. I’m considering this more an experiment than a major station change, and I won’t even shoot new pictures until I decide exactly which of the possible permutations of Amps & Tuners I will run with.